If that's the case, then look no further! 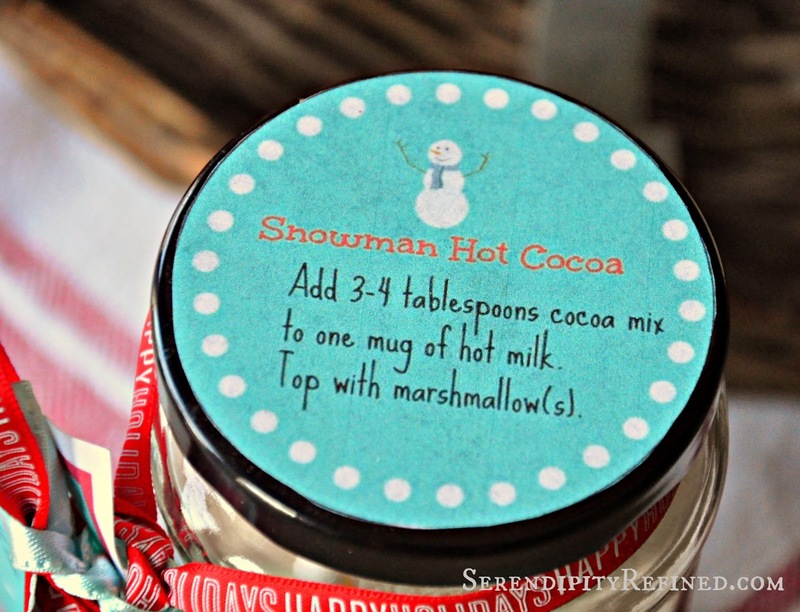 This hot chocolate (or do you say hot cocoa?) recipe with snowman face marshmallows can be made in under an hour and I've even included free printable labels and gift tags! Best of all, there's no cooking involved! Simply draw the faces onto the marshmallows with edible marker (I found mine at Walmart). 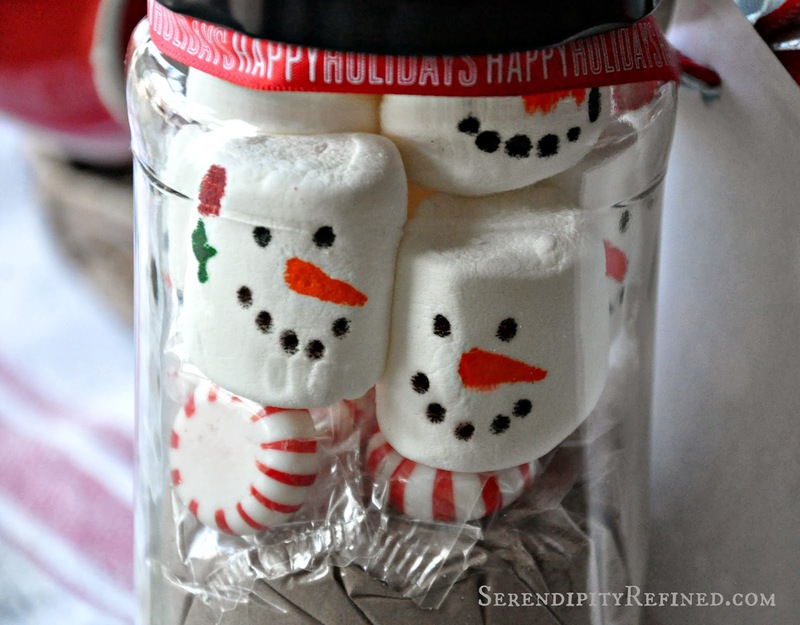 You don't even need to use a mason jar. I had another jar on hand but since I happen to know that you can find mason jars just about everywhere (except in the stack of boxes which are labeled "kitchen" and still not unpacked from my move in August) I'd use them. 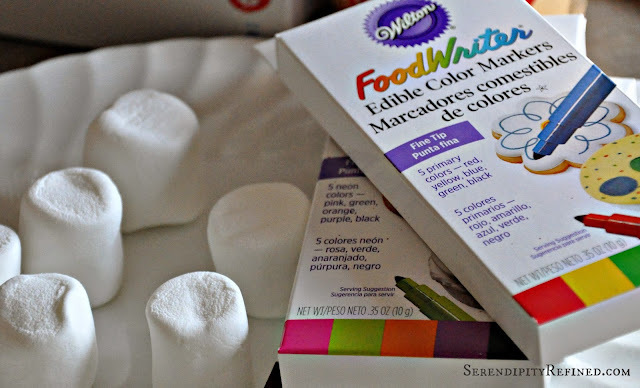 Edible food markers are so much fun! Honestly, I had to stop myself before I drew faces on the entire bag of marshmallows! Allow the faces on the marshmallows to dry while whisking the cocoa mix ingredients together in a large bowl. Spoon the cocoa mix into sandwich sized zipper bags then place the mix and marshmallows into a jar with the mix on the bottom and the marshmallows on the top. I also added a few peppermints (left over from my Peppermint Candy Wreath Tutorial) in the middle of the jar for color. Download and print the instruction labels and gift tags at the end of this post onto card stock. Cut the instruction label into a circle to fit the top of the jar and adhere using spray adhesive or glue. 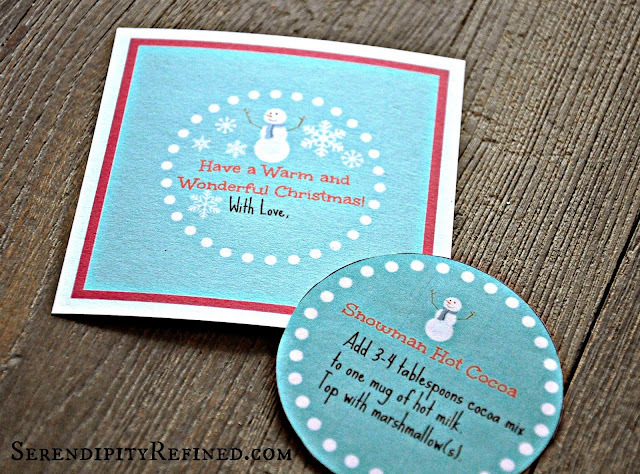 Cut the gift tag into a square and sign your name. 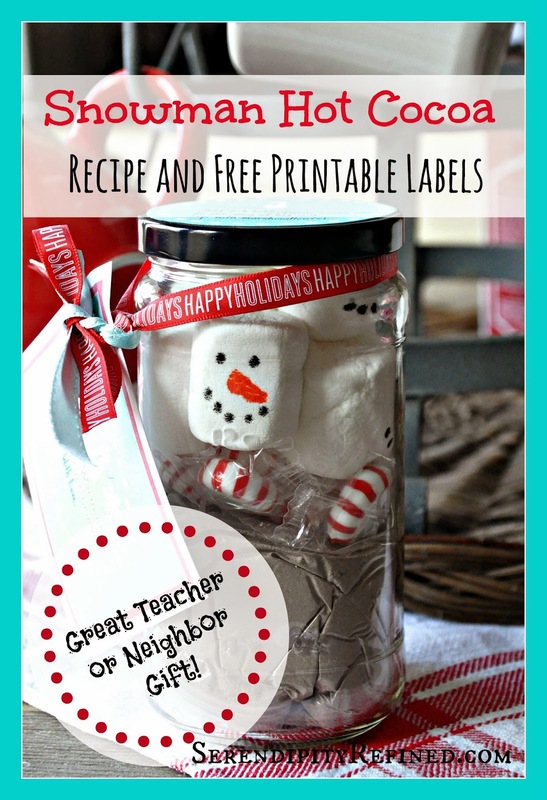 Hole punch the tag, tie a piece of ribbon around the top of the jar and attach the tag. 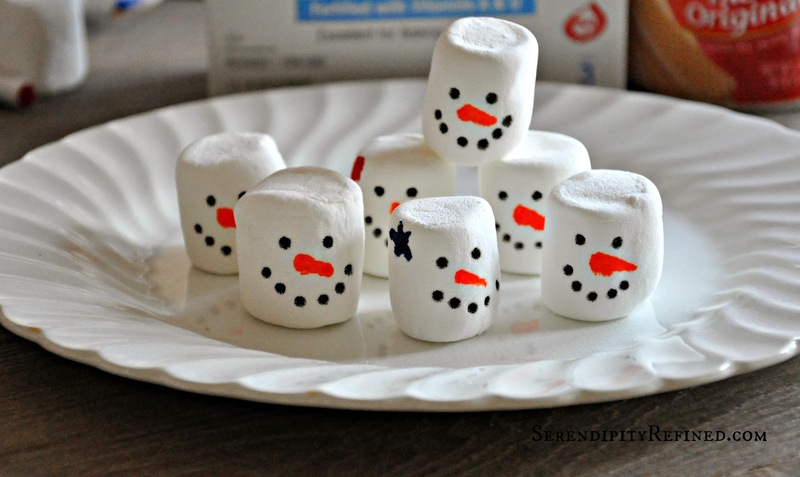 This is such an easy craft that it could even be done with children. The markers are simple to use. However, the cocoa powder is messy so don't say that I didn't warn you! 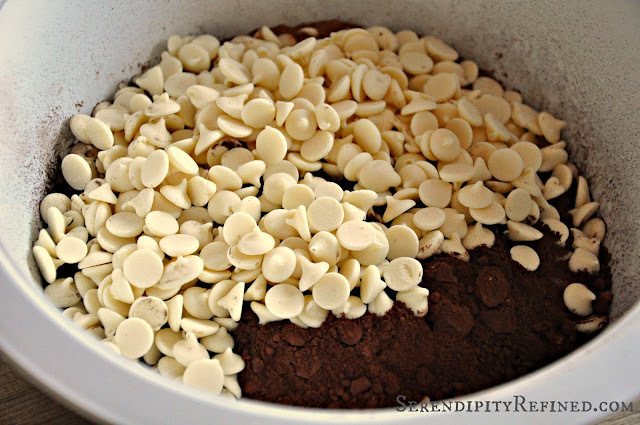 Using a food processor, working in small batches, pulse the mix until the chocolate is finely chopped and combined. Spoon the mix into sandwich size zipper bags. 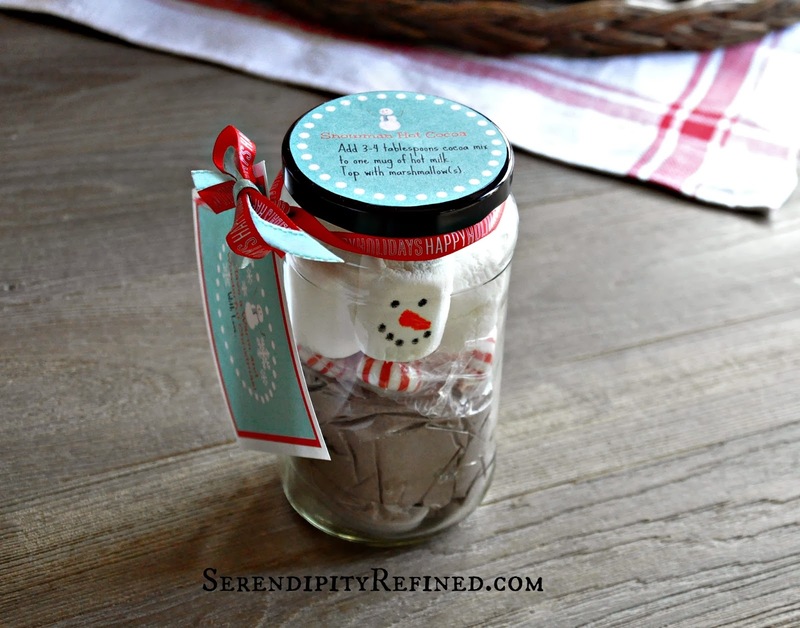 (The amount will vary by the size jar that you use.). I use about a cup of the mix which should make about 4 servings. Click on the link to download. After the download is complete, click on the arrow to open, then print. 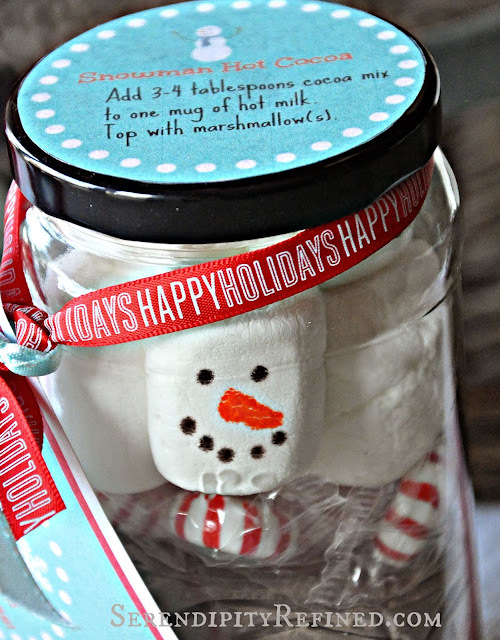 Who could possibly resist a mason jar full of smiling snowman faces and a warm cup of home made hot cocoa on a chilly winter day?! Certainly not me!